Peerpharm Ltd. are one of the leading manufacturers of cosmetics in Israel. Their brands include the Mineralium premium range of Dead Sea skincare, Andrea Milano makeup, Spa Pharma Dead Sea cosmetics and a number of other consumer and professional brands of makeup and haircare. Their sales have mostly been domestic and they turned to the WM Consulting Group to ask for assistance in planning for ways of expanding abroad. Overall, our recommendation to Peerpharm was to develop online direct retail sales in order to maximize profitability and create a direct connection between the company and its consumers. By maintaining inventory in fulfillment centers around the world it would be possible to provide fast and efficient delivery of products to consumers as well as a way of dealing with returns and exchanges. Marketing the brand is via an intensive social media and online promotion campaign using Google AdWords, Pinterest, Facebook, Twitter, Blogs, Competitions and a range of other techniques. 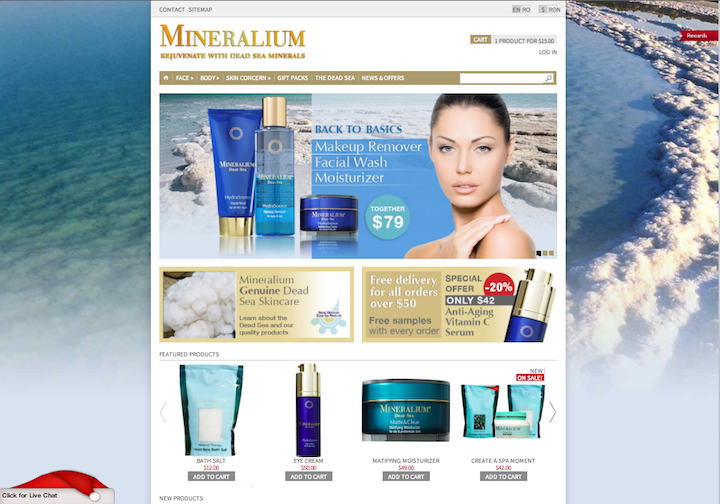 We designed a multilingual multi-currency web site for Mineralium focused on encouraging the visitor to make a purchase. Extensive use of coupons and discounts via social media is enhanced by sale items and visual indications to encourage sales. On the site, we have also included online chat and a reward program to encourage visitors to Like and Share what they see. A PPC campaign in AdWords is running to direct traffic both to landing pages and directly to the site. Credit card payment is processed using either Paypal of local payment solutions according to the country. The website is now online in English and Romanian and the online marketing campaign is in full swing.